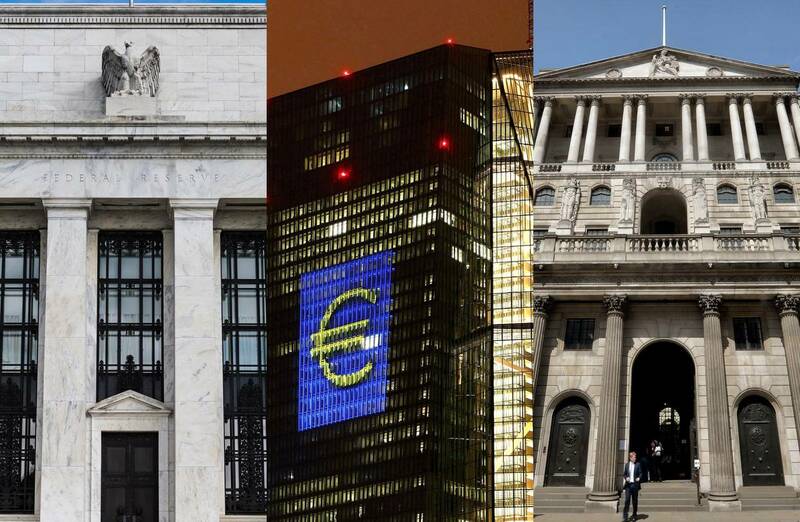 The European Central Bank (ECB) surprised no one when it announced today that it was keeping all three of its key interest rates unchanged. The Governing Council said that rates would be kept at current levels for “an extended period of time, and well past the horizon of the net asset purchases." In effect, this means there’s no end in sight for the ECB’s loose monetary policy. Back in October the central bank extended its Asset Purchase Programme (APP) by nine months to September 2018. It also reduced its monthly bond purchases to €30 billion from €60 billion. But ECB President Mario Draghi was insistent that the APP could be extended in both size and duration if warranted by financial conditions, particularly if inflation fails to head up towards the ECB’s sub-2% target. This was repeated in today’s statement. The central bank also nudged up its forecasts for Euro zone GDP growth for this year, 2018 and 2019. Economic growth for 2018 is now expected to rise 2.3% (up from 1.8% previously) before dropping back to +1.9% in 2019. But crucially the Governing Council anticipates inflation coming in well below target for the next three years, when its forecasts stop. The news triggered a sell-off in the euro. This saw the dollar make back a fair portion of yesterday’s losses which followed on from the Fed’s “dovish rate hike” (see below). Earlier on today all nine members of the Bank of England’s Monetary Policy Committee voted to keep the official Bank Rate unchanged at 0.5% as expected. This came as no surprise after last month’s 0.25% rate hike which was accompanied by the quarterly Inflation Report. Back then the Bank made it clear that they were in no hurry to raise rates further, signalling that the market’s forecast of two more 25 basis-point rate hikes before the end of 2020 was in line with the BoE’s thinking. They also forecast that CPI inflation would peak in October at 3.2% before pulling back as the deflationary effects of sterling’s post-referendum sell-off wane and as more favourable energy price comparisons kick in. Earlier this week the CPI update for November came in at 3.1% annualised, hitting its highest level since March 2012 and still well above the Bank’s 2% target. Once again, the Bank assured investors that inflation "may be close to its peak", and that "any future increases in Bank Rate are expected to be at a gradual pace and to a limited extent." On top of this, concerns over Brexit should stay the Bank’s hand even if inflation should tick higher from here. As the Bank noted in today’s statement Brexit remains the “main challenge” for monetary policy. At last night’s Federal Reserve meeting the US central bank raised rates by 25 basis points, as expected. On top of this, the FOMC’s quarterly Summary of Economic Projections saw the committee keep its overall forecast for rate hikes in 2018 unchanged from September with three 25 basis point increases anticipated throughout 2018. There had been speculation ahead of the release that the committee would nudge this up to 100 basis points for next year. So the FOMC appeared less hawkish than expected over the short-term although they did raise their longer-term forecast. They now expect fed funds to rise to 3.1% in 2020, compared to 2.9% in September’s summary. There were some other tweaks. The Fed now sees US GDP rising by 2.5% in 2018 – up from 2.1% last quarter. Meanwhile unemployment is expected to continue on its downward trajectory, breaking below 4.0% next year. Yet there was no change to the FOMC’s PCE inflation forecast which is seen as edging higher before topping out at 2.0% from 2019 onwards. The US dollar dropped on the news while precious metals flew higher as the overall market takeaway was that this was a “dovish rate hike”. US stock indices did what they always do these days on any piece of news – that is, swing about a bit before finding reasons to push higher. Janet Yellen’s term as Chair of the Federal Reserve ends officially on 3rd February next year when Jerome Powell will take over, assuming that the Senate confirms him as her successor. There is a two-day Fed meeting over 30th – 31st January which means that this week’s meeting was not Dr Yellen’s last as Fed Chair although it was her last press conference. With the December meeting the venue for the FOMC’s quarterly Summary of Economic Projections, January’s should be little more than a baton-passing ceremony.